Dream Pod 9: Heavy Gear Blitz Kickstarter Update: Plastic Injection Molds, Plus Jackal & Mameluk Two Packs Preview! Its been a while since our last Heavy Gear Blitz Peace River & NuCoal Kickstarter update. We want to let you all know that work has started on the plastic injection molds. Mold flow analysis for all the Peace River and NuCoal model sprues has been done in preparation for making the molds. Todays update includes a few images below from the mold flow analysis of the Warrior IV & model sprue where they tested with just 2 entry points for the plastic to see how it would flow into spues mold cavities. They use this test see to where the plastic will have trouble reaching with only 2 entry points and then will decide where to place additional entry points for the molten plastic so that it reaches and completely fills all the parts. Below that we have the cooling flow image used to see how long it will take for the model sprue to be cooled down before being ejected and starting the plastic injection for the next sprue. With this they see if extra cooling pipes are needed to run cold water thru the plastic injection mold to speed cooling and increase the cycle time of the mold. They run a lot more tests as part of mold flow analysis, we have only showed 2 of them below. 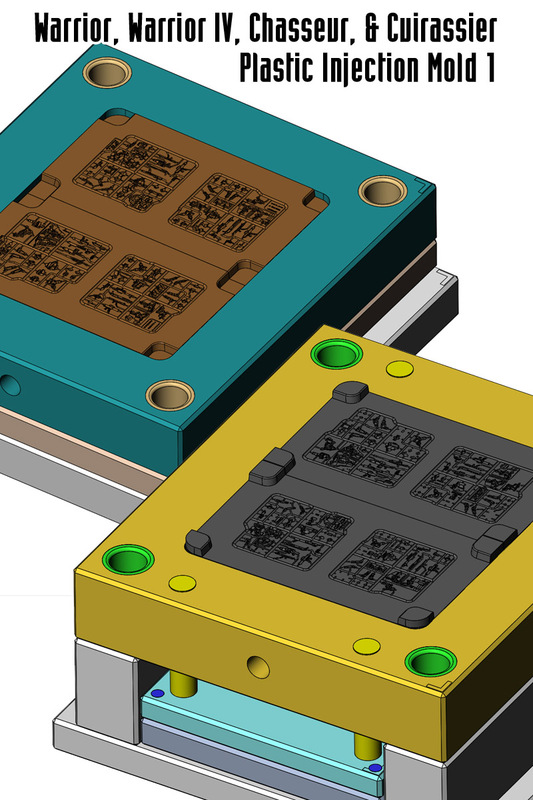 Now the mold production company will take all the results of the sprue mold flow tests and prepare a plan for each of the molds, with how many molten plastic entry points are needed, water cooling pipes, and ejector pins for each model sprue. Mold 1 will include the Warrior, Warrior IV, Chasseur, and Cuirassier plastic model sprues, see the top and bottom plate images below. Mold 2 will include the Skirmisher, Crusader IV, Jerboa, and Chevalier plastic model sprues. Mold 3 will include Commando, Recce, & Support Armigers and Drones from the Utopia Kickstarter. We made the vulcanized rubber molds earlier this month for the Peace River Jackal Two Pack pewter minis and the Mameluk Two Pack resin and pewter minis. 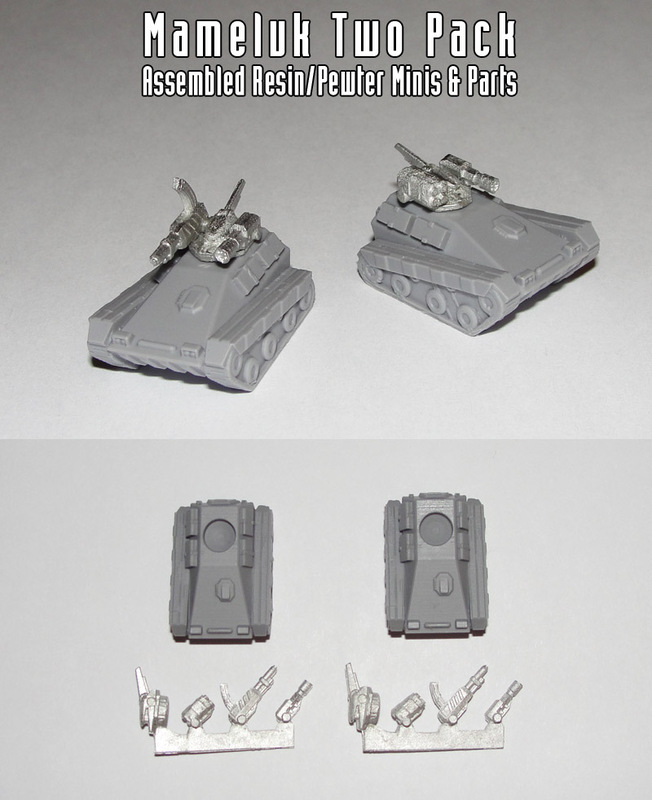 Check out below the preview photos of the assembled Jackal Two Pack pewter minis and their parts. 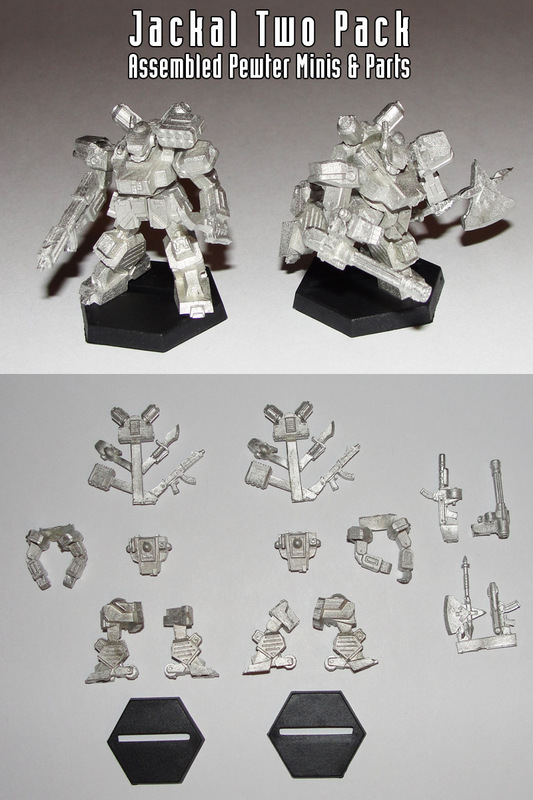 Followed by photos of the assembled Mameluk Two Pack resin and pewter minis and their parts. 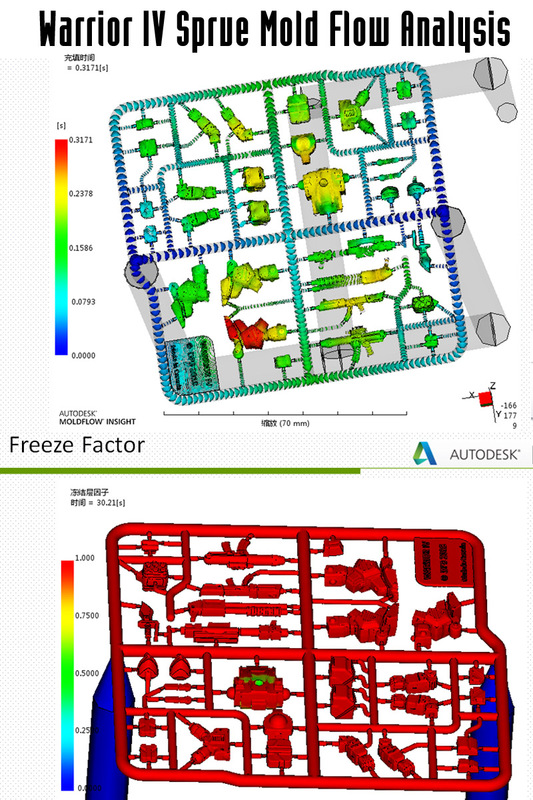 Once all plastic injection mold plans are finished and approved, the mold plates will start being cut and EDM process used to make all the fine part details in the molds. We'll get more updates done on the molds and their expected delivery time to the company here in Canada, that will be popping all the plastic model sprues for us, as we know more. Also in January we'll get the vulcanized rubber molds made for the Spartan Two Pack and Arbalestier pewter minis, then get photos taken and do another update for everyone to checkout. Home › Blogs › Robert Dubois's blog › Heavy Gear Blitz Kickstarter Update: Plastic Injection Molds, Plus Jackal & Mameluk Two Packs Preview!